The unending crisis rocking the Social Democratic Party (SDP) over who should fly its presidential banner in the 2019 general elections is not over yet. Rather, the tussle for the ticket is getting messier as the gladiators now head to the Appeal Court to determine the authentic presidential candidate of the party in spite of an earlier court pronouncement on the same issue, writes Dare Odufowokan, Assistant Editor. CHANCES that the Social Democratic Party (SDP) will put up a good showing during the next presidential election is dwindling as two of its prominent chieftains continue their legal struggle for the presidential ticket of the party, barely six weeks to the all important electoral contest. In spite of efforts by party elders and other well wishers to end the furore as well as a pronouncement at the tail end of last year, the matter of who the party’s presidential candidate is remained unresolved. Findings by The Nation revealed that the party may have been divided into two groups of supporters lining up behind the contenders for the ticket, former Governor Donald Duke of Cross River state and former Information Minister, Jerry Gana. “The SDP is unprepared for the next elections, at least the presidential race. Today, we have a party divided into two over the presidential ticket. “Following the High Court judgement last month, efforts were made to find a political solution to the crisis but the gladiators, especially those backing the two men in the eye of the storm, made things difficult. We got to a stage that we almost convinced the duo to share the tickets with one being the presidential candidate and the other the running mate. We almost achieved this before their supporters scuttled the process. Now, the crisis has moved to the Appeal court,” a source said. 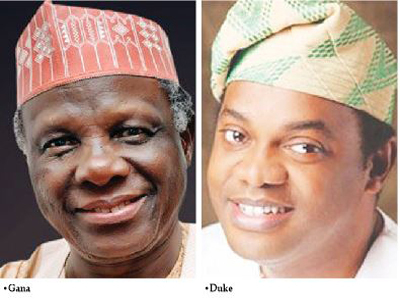 As it is, the Court of Appeal in Abuja has fixed January 15 for hearing of the appeal filed by the national leadership of the party challenging the High Court judgement that removed Duke as its presidential candidate and replaced him with Gana, who had approached the court seeking to be declared as the rightful person who should fly the banner of the SDP during the 2019 elections. The High Court sitting in Maitama, FCT, on December 14, sacked Duke and declared Gana, as the winner of the presidential primary election of the party conducted on Oct. 6. The court agreed with Gana that Duke’s emergence contravened the zoning clause in the party’s constitution and as such should not be allowed to stand. Thus, Gana, who came second in the primary election, was handed the presidential ticket as requested. Not satisfied with the high court judgement, the party and Duke approached the appellate court through their lawyer, Eyitayo Jegede (SAN), for an upturn of the judgement. Speaking after the controversial High Court judgement, Duke said “While we await a copy of the judgement for a detailed review, it is imperative we reiterate our constitutionally backed belief. When the matter was called by the court during the week, Jegede said the matter was adjourned on Monday for a report of success or otherwise of service of processes on Gana. They had told the court on Monday of the difficulty in serving the processes on the respondent which led the court to grant an order of substituted service. While confirming to the court that Gana on has finally personally received the processes, his lawyer, M.S. Ibrahim, pleaded with the court for a leave of 21 days to allow them respond to the issues raised in the processes. Jegede, however, argued that with the elections barely five weeks away, it would be expedient for all parties and the court to judiciously manage time. After much argument over the matter, with the appellants accusing the respondents of trying to waste the time of the court over a matter that is time bound given the urgency needed as the election date draws nearer, the three-man panel of the court led by Justice Adamu Jauro, directed that Gana should file his response within eight days and adjourned the hearing to January 15. However, the SDP said Duke remained its presidential candidate even as the ruling of a lower court that gave the candidacy to Prof. Jerry Gana is being challenged. Its Director, Media and Publicity, Yemi Akinbode, said no order was made with respect to the enforcement of the lower court judgement put on hold owing to the motion filed by the Appellants. Akinbode said Duke was validly nominated at the party’s October 6 national convention and his name already submitted to the Independent National Electoral Commission (INEC). He recalled that ex-Minister of Information, Jerry Gana congratulated, hugged and wished Duke well after the result of the primary election was announced. The party spokesperson added that the constant references to the SDP Constitution by those kicking against Duke’s candidacy is premature and misplaced. He insisted that any claim that Southsouth candidates were barred from participating in the primary is untrue. He asked why the issues about zoning and constitutional provisions were not raised before and during the shadow election. “Ex-governor Duke emerged through a transparent process and delegates were never directed to vote for any presidential aspirant. Those now asking that he should be screened out or disqualified should have raised that before or during the election. There were two aspirants from the South-South Zone and three aspirants from the North Central Zone. Duke was the first person to submit the nomination form at a widely publicised event and no one ever protested until he won the primary. All the four other contestants including Prof. Gana actively participated in all the preliminary and final stages of the presidential primary and SDP did not issue any statement directing its members to vote for or against any presidential aspirant from any particular geographic zone. The party understands that Gana was very disappointed by the outcome of the primary. “So the party sent a high-ranking delegation headed by National Chairman Chief Olu Falae to visit and explain to him, to assuage his feelings and appreciate his contributions to the party. We duly appreciate the significant contributions that the elder statesman Gana has put to the development of the party since he joined six months ago. Above all, they had privately and publicly appreciated the tremendous contributions that he has made to Nigeria over the last 45 years,” he explained. Further checks by The Nation revealed that as part of efforts to politically resolved the crisis, the leadership of the party had before and after the High Court judgement appealed to Gana to accept the result of the primary election and join Duke on the ticket as the Vice presidential candidate of the party for the forthcoming 2019 presidential election. But Gana, it was learnt by our correspondent, rejected all offers other than the presidential ticket. ‘Especially after he got that controversial judgment in his favor, he refused to listen to any other suggestion. All he wants is the presidential ticket. But the party, conscious of the fact that he didn’t win the primary election and unwilling to trample on the rights of the man that won, refused to accede to his demands,” our source said. Speaking on the crisis recently, the former Minister said he is in the SDP to win the forthcoming 2019 presidential election and not to be running mate, hinting that he will not accept any offer for him to deputize Duke on the party’s ticket. He warned the leadership of SDP not to take the decision of him becoming running mate to Duke, if the party wants to win election. “I do not mind at all but, the party will definitely want a strategy, that is a winning strategy. Let us be very realistic the South South have just concluded a turn of the presidency during former President Goodluck Jonathan, if Nigerians are to be real they will know that it is too soon to have a presidential candidate running for an election from that zone. “The other zones of Nigeria would also want to have the vote, so if you want to win election the party will not do that. But if they want to just play politics they would do that. I am not for that I am for winning election,” the former Minister, who is now before the Court of Appeal to ensure that the presidential ticket handed him by the lower court last December is not taken away from him, said.